“As soon as you free yourself, you’ll have a better day,” our guide Don Murch said. He was speaking to a group of five veterans, including me, who had spent time in Iraq or Afghanistan. If we would embrace the cold, icy water on the tundra, we could instead spend our energy paying attention to the majesty of our surroundings. We had all spent time in the armed forces, but for me—and maybe for the others—this felt like the first time I really understood what it was I had meant, or at least what Congress and the president had meant, by saying we were fighting for our country. This was physically our country. The Arctic held all in one place the best of what our nation’s high-minded philosophy of liberty and justice for all had to offer. The freedom was not easily won and the justice could be cold and, at times, miserable—but I received the just dues for whatever actions I took. I could walk wherever I wanted and in any direction I wanted. No one was there to stop me because of what I believed, who I loved, or the color of my skin. Every sunset and sunrise greeted our group with equal beauty. No one got any more or less sunshine unless he ran, often without luck, to escape a shadow. There’s beauty and wildness all over our great country, but nowhere else is it so big and nowhere else is it so whole and uncut. All the good that remains in the American dream is in the Arctic. 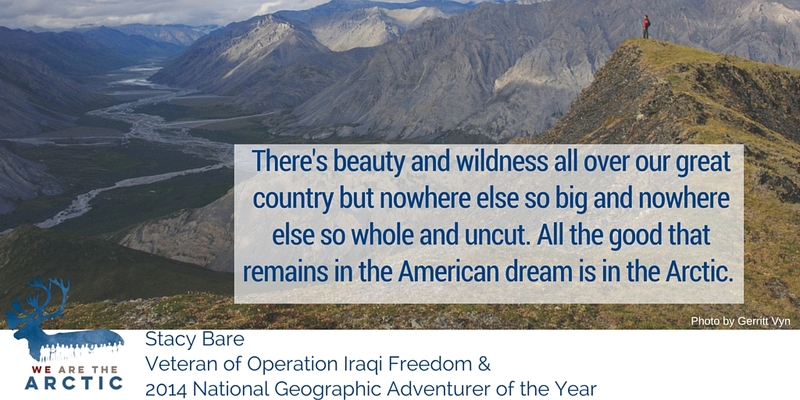 Stacy Bare is a 2014 National Geographic Adventurer of the Year and a brand ambassador for The North Face and Keen Shoes. He received the Bronze Star for Merit during Operation Iraqi Freedom. Hear Stacy explain in a video why he's joining conservation and religious leaders, Alaska Natives, communities of color, outdoor enthusiasts and communities of faith from across the U.S. to protect the Refuge. We urge the strongest protections for the Arctic landscape, wildlife and people.